Once inside the fence, Zhou began taking images of communications antennas and equipment at a site called an "antenna farm"—sensitive equipment used by the military, anti-drug, and intelligence agencies at the base. 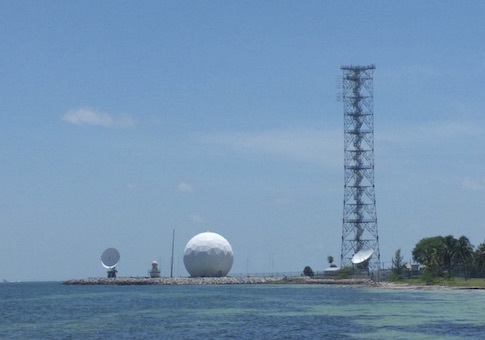 The base is the southernmost point in the United States and home to Southern Command's Joint Interagency Task Force South, a group engaged mainly in countering illicit trafficking but also charged with intelligence gathering and other military activities. The base also trains pilots from all services in air-to-air combat. A squadron of F-18 jets and the Army Special Forces Underwater Operations School are located at the base. Zhao pleaded guilty to one count of illegally photographing a vital military facility. On Tuesday, U.S. District Judge K. Michael Moore in Key West sentenced him to a year in prison, the maximum sentence for the espionage-related charge. Court documents in the case and law enforcement sources provided new details of a rare case of Chinese intelligence agencies targeting an East Coast military facility for spying. Chinese agents in the past were detected spying on military and intelligence facilities in Japan, Hawaii, and Alaska, including the missile defense base at Fort Greely. FBI investigators searched Zhao's Miami hotel room after his arrest and discovered a blue shirt and belt buckle worn by Public Security Ministry police. The ministry is China's main political police and intelligence service focused on domestic security. Security analysts say it is unusual for Public Security Ministry personnel to conduct overseas spying, a task usually carried out by operatives from the Ministry of State Security or People's Liberation Army (PLA) Second Department, known as 2PLA. Public Ministry agents, however, have been detected in the United States conducting illegal surveillance and harassment of Chinese dissidents and nationals in the past. During the base intrusion, Zhao was quickly stopped by armed military police at the Key West base. He was then arrested by Key West police before the case was turned over to FBI counterintelligence agents. Zhao, according to court papers, lied to FBI agents during questioning Dec. 7 stating he was in the last year of a four-year music program at the North University of China. However, his visa application stated he did not began the music program until 2017. "Evidence recovered from [Zhou's] cellular phone further showed documentation of a university engineering course curriculum—when confronted with this information, Zhao Qianli simply stated he ‘did not know how it got on my phone,'" one document said. Zhao also told the FBI he underwent military training as a university student but failed to disclose the military service on his visa application, as required. China North University is a military entity that had several names since its founding in 1961. The school is focused on conventional arms, including artillery, automatic weapons, ammunition, and fuses. It has been under the National Defense Science, Technology and Industry Committee, and designated one of eight defense industry colleges. In 1993 the school was renamed North China Institute of Technology before becoming North University of China in 2004. Asked about the police shirt and belt from the Public Security Ministry, Zhao told the FBI the items were given to him by his father who wanted him to have nice clothes for the U.S. visit. Investigators also suspect Zhao lied about his age. He said he is 20 years old, but appears older. He also falsely told investigators he worked as a dish washer in New Jersey. His visa also had expired. Zhao also said he had visited Key West to see the home of the late novelist Ernest Hemingway. However, a search of his Motorola cell phone and Canon EOS digital camera found no images of the residence or any other images outside the base. "After entering the restricted facility, witnesses observed Zhao Qianli walk directly toward the restricted JIATF-South antenna field and take several photographs with his Motorola cellular telephone and Canon EOS digital camera," the plea agreement states. "Witnesses then observed Zhao Qianli take photographs with these devices of various other government buildings within the vicinity of the restricted JIATF-South Antenna Field." It is not known why China spied on the base. However, collecting close-up images of the antenna field equipment suggests Chinese intelligence is seeking to learn details on American military communications equipment that could be used in future electronic warfare or cyber attacks. Nicholas Eftimiades, a former CIA and DIA officer who who specialized on China, said the case is an example of aggressive Chinese intelligence operations against military targets. The case should prompt more aggressive counterintelligence operations against the Chinese, he said. "The arrest and conviction of Zhao Qianli is clear evidence that the PRC is actively collecting against U.S. military communications for cyber penetration," he said, using the acronym for People's Republic of China. "Zhao's history of associations with the PRC military and security apparatus, along with his blatant attempt to collect information on the U.S. Southern Command's Joint Interagency Task Force antenna array should elevate the threat condition level for U.S. and allied military facilities." In wartime, Chinese military electronic warfare units are expected to use countermeasures designed to disrupt enemy communications that are vital warfighting tools used to control both conventional and drone weapons and forces. During the court hearing Tuesday, federal prosecutor Michael Sherwin said Zhao had to go into the water to circumvent the security fence at the base that included signs warning it was a restricted area. "The primary pictures on that camera were of the military facility," Sherwin said, according to the Miami Herald. "It did not have the hallmark of a tourist who got lost and wandered onto the military facility." Zhao's lawyer, Hongwei Shang, insisted during the hearing that Zhao was not a spy and compared him to American student Otto Warmbier who was arrested in North Korea in 2017 and later died after he was released from 17 months in captivity. The mention of Warmbier angered the judge who noted that the American in North Korea did not take pictures or video of North Korean military bases as Zhao did in Key West.